Bob McCarthy has been involved in the design and analysis of sound systems for over 30 years. As a pioneer in the development of Meyer Sound’s SIM System he has helped push the science of tuning sound systems from the laboratories into practical world of theaters, arenas and stadiums. 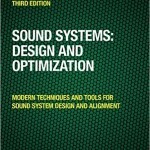 Bob is recognized worldwide as a leading specialist in sound system design and optimization and has shared his experience through the years via his seminars and multiple books on the subject.